Or maybe not. But either way I'm going to say it. There's a fine line somewhere between: just fixing obvious typos in what someone actually said; and totally changing what they actually said. Or maybe there is no line, and it's just a continuous slope. Anyway, I'm going to cross that fine line here, and go a long way down that slope. But I don't really care. Because ideas are more important than our fallible attempts to express them. So while it would be sorta neat if Steve said "That's exactly what I was trying to say! ", it probably won't happen, and it doesn't really matter, and it's much more important if people say "Saying it that way makes sense". Because it does make sense, if we say it this way. Aggregate actual nominal income equals aggregate expected nominal income plus amount of new money created by the banking system minus increase in the stock of money demanded. Nothing in the above violates any national income accounting identity. Start with aggregate planned and actual and expected income and expenditure all equal. Now suppose that something changes, and every individual plans to borrow an extra $100 from the banking system and spend that extra $100 during the coming month. He does not plan to hold that extra $100 in his chequing account at the end of the month (the quantity of money demanded is unchanged, in other words). And suppose that the banking system lends an extra $100 to every individual and does this by creating $100 more money. The individuals are borrowing $100 because they plan to spend $100 more than they expect to earn during the coming month. Now if the average individual knew that every other individual was also planning to borrow and spend an extra $100, and could put two and two together and figure out that this would mean his own income would rise by $100, he would immediately revise his plans on how much to borrow and spend. Under full information and fully rational expectations we couldn't have aggregate planned expenditure different from aggregate expected income for the same coming month. But maybe the average individual does not know that every other individual is doing the same thing. Or maybe he does know this, but thinks their extra expenditure will increase someone else's income and not his. Aggregate expected income, which is what we are talking about here, is not the same as expected aggregate income. The first aggregates across individuals' expectations of their own incomes; the second is (someone's) expectation of aggregate income. It would be perfectly possible to build a model in which individuals face a Lucasian signal-processing problem and cannot distinguish aggregate/nominal from individual-specific/real shocks. So at the end of the month the average individual is surprised to discover that his income was $100 more than he expected it to be, and that he has $100 more in his chequing account than he expected to have and planned to have. This means the actual quantity of money is $100 greater than the quantity of money demanded. And next month he will revise his plans and expectations because of this surprise. How he revises his plans and expectations will depend on whether he thinks this is a temporary or a permanent shock, which has its own signal-processing problem. And these revised plans may create more surprises the following month. It doesn't matter for this story what that "something" was that changed and started the whole thing rolling. It might have been: a change in the central bank's behaviour; a change in commercial banks' behaviour; or some change from outside the banking system. We know that a sensible central bank would eventually do something else to stop the whole thing rolling before aggregate planned nominal expenditure gets too big for consistency with the inflation or whatever target. Because there is a supply-side and Phillips Curve out there somewhere. If this process doesn't stop by itself, the central bank will make it stop. This is not a long run story. It won't explain long run increases in money or debt. And it is not a story about all growth in income, because it is perfectly possible to have income growth where planned and expected and actual expenditure and income are all the same. It's a demand-side story of the transition from one growth path to another, where expectations may be false during that transition. We are talking about a Hayekian process in which individuals' plans and expectations are mutually inconsistent in aggregate. We are talking about a disequilibrium process in which people's plans and expectations get revised in the light of the surprises that occur because of that mutual inconsistency. We are talking about what Old Keynesians talk about when they zig-zag slowly to the equilibrium point in the Keynesian Cross diagram. We are talking about what monetarists talk about when they talk about the hot potato process where the actual stock of money is greater than the quantity of money demanded. I have blogged about this before. And again before that. In your discussion each individual, at the beginning of each month, make a financial decision about how the rest of the month will go for him. Would I be correct in interpreting you as implying that there are two factors in his decision, how much consumption he wants and how much money demand. First, he considers how much of a flow of goods he wants to consume based on an implicit "consumption function." Second, he considers how much money he wants to hold as stock based on an implicit "money demand function." When these two function collide he makes a decision. In summary, he must make a decision about how much he wants as stock AND as flow, each determined by their own "function." More of one necessarily means less of the either, either to him or somebody else from whom he gets the money to hold as stock or purchase as flow. I believe this is what Keen said/says. "In a credit-based economy, aggregate demand is therefore the sum of income plus the change in debt, with the change in debt spending new money into existence in the economy. This is then spent not only goods and services, but on financial assets as well—shares and property. Changes in the level of debt therefore have direct and potentially enormous impacts on the macroeconomy and asset markets, as the GFC—which was predicted only by a handful of credit-aware economists (Bezemer 2009)—made abundantly clear." JoeMac: I don't think we have to treat those as separate decisions. Tom: thanks! I'm not sure if Steve Keen's followers will respond the same way. Oh well. 1. The National income accounting problem, because if people actually buy the goods they demand, aggregate demand will equal income. 2. Some debt does not involve money. If I borrow $100 from you (and you are not a bank) debt goes up my $100, but there is no money creation. And it's not obvious whether this causes AD to go up or down, because we don't know whether it was caused by my increased desire to spend or your increased desire to save. Nick, couldn't you also "prove" this identity by constructing it for individuals, and then aggregating? "1. The National income accounting problem, because if people actually buy the goods they demand, aggregate demand will equal income. 2. Some debt does not involve money. If I borrow $100 from you (and you are not a bank) debt goes up my $100, but there is no money creation. And it's not obvious whether this causes AD to go up or down, because we don't know whether it was caused by my increased desire to spend or your increased desire to save." 1) Should the definition of aggregate demand (AD) include financial assets? I think Keen includes it in his definition of AD. 2) No "money" creation, OK. If I save $100 in "money" taking it out of circulation and you borrow the $100 and spend it on goods/services, isn't AD unchanged? Heaven forbid should anyone try to use math here. Let's just keep on trying to guess what we all meant! Seems fitting given Noah's (somewhat bizarre) recent post, and Krugman's (exactly on point) reply. Also, we've all seen Keen's struggles with basic math before, so maybe we are all better of if he avoids trying to use it. If Steve Keen is saying what Nick thinks he is saying, then what Steve is saying is much the same as what MMTers say: i.e. that hot potatoes are important. Or put another way, the above lot have all tumbled to something that was obvious to the average street sweeper all along, namely that if someone wins on the lottery, they’re liable to spend some of their winnings. Or have I missed something? ""In a credit-based economy, aggregate demand is therefore the sum of income plus the change in debt"
this always sounds to me rather like assuming V is a constant in MV=PY, so changing M changes PY. I think he's getting at the point that credit creation via banks increases the money supply, and puts money in people's hands they can spend without having earned it first, which is fair enough, I think that is part of the process whereby AD may rise, but what's the velocity of this "change in debt"? I may have misunderstood him. this is a great post and I think what you describe actually happens. But I think the claim "This is not a long run story" could potentially be modified, depending on what you think happens on the supply side. Suppose there is a persistent (decade-long) credit expansion, the usual story about people funding spending by borrowing, extracting equity from property. Isn't there a coherent story in which this "demand pull" draws forth a supply side response (more investment, more labour supply, perhaps innovation)? So the CB wouldn't necessarily slam on the brakes (perhaps also because cheap imports were interfering within inflation data). So not a long long-run story but perhaps a decade-long story? I am trying to figure out whether standard mainstream macro is missing anything important by abstracting from all this. According to my shaky understanding of mainstream macro, if for some reason - animal spirits - people want to consume more today than they did yesterday, the required supply side response (increase in labour supply and investment?) just happens smoothly and simultaneously, the model doesn't worry about breaking the process down into granular time and explaining how somebody can spend more one period than they earn, how different agents' expectations adjust as they observe what the actions of other agents mean for their own incomes etc. It's all just rolled up. So this omission means mainstream macro won't be telling any stories about credit expansion fuelled booms. But mainstream macro spends most of its time studying monetary and fiscal policy responses to negative shocks, and doesn't worry too much about fleshing out the detail of those shocks. I cannot guess whether the answers to those questions would change if mainstream macro introduced this role for banks. Everybody is busy trying to add the financial sector to macro models, but I am less sure about this aspect of the financial sector. Alex: "Nick, couldn't you also "prove" this identity by constructing it for individuals, and then aggregating?" I've been wondering about that. A better way to say what you just said: what assumptions would I need to make to ensure that that equation holds? Clearly I need to assume that each individual has a coherent plan, given his expected income (that his plan does not violate his budget constraint). At the individual level, that equation wouldn't hold, because an individual could also be planning to buy or sell things like land or used goods or non-monetary financial assets. The question is whether those things would cancel out in aggregate. And they might not, because if everyone were (say) planning to sell $1,000 worth of land, in aggregate their plans would be inconsistent. Which brings me to TMF's point: "1) Should the definition of aggregate demand (AD) include financial assets? I think Keen includes it in his definition of AD." Or include things like land too. Well it might be more useful to redefine "AD" that way, but in this post I wanted to stick to the conventional definitions of everything, because I wanted to make sure I got a version that did not violate NIA identities, which are expressed in terms of those conventional definitions. TMF: "2) If I save $100 in "money" taking it out of circulation and you borrow the $100 and spend it on goods/services, isn't AD unchanged?" Yep, which goes back to Say's Law. Except that if you decide to save more, that might lower interest rates to persuade me to spend more, which might affect borrowing from banks. David: Hey! I did use math! There are three equations in this post, and I used algebra to substitute the second equation into the first, to derive the third. I just wrote them out longhand, writing "equals" instead of "=". And I wrote: "Aggregate expected income, which is what we are talking about here, is not the same as expected aggregate income. The first aggregates across individuals' expectations of their own incomes; the second is (someone's) expectation of aggregate income." which makes the important math point that it matters whether "E" appears to the right or left of the summation operator! Ralph: I think that misses something. Money is unique in being the medium of exchange. Almost anything is wealth. Luis Enrique: (quoting Steve Keen) """In a credit-based economy, aggregate demand is therefore the sum of income plus the change in debt""
What that misses is that some debt has nothing to do with the creation of money, and doesn't have any obvious effect on either the supply or demand for money, or on AD. Like if I borrow $100 from TMF. Plus, in an economy with excess supply of goods, actual income will always equal AD, regardless of whether debt or money is increasing. The reason it can't be a long run story is that it requires people to be consistently surprised on the upside. Every month, for month after month, their income is higher than they expected it to be. If you promise to pay me $100, and then I take the note to a bank and factor it in exchange for $95 of bank-created money, then unquestionably money has been created. People create lendable collateral all the time independent of monetary policy--this is why the MMT "all money flows from government spending" concept is a fallacy. yep I see that, I think when Keen writes "debt" he does not have personal borrowing or whatever in mind, I assumed he meant net credit creation via the banking system, or something similar, so that he is talking about money creation. Maybe I assume wrong. I don't quite follow the requiring people to be consistently surprised thing. I guess some people might keep getting nice surprises, but I had in mind an expansion in which each year planned nominal expenditure equals aggregate expected nominal income plus amount of new money created by the banking system, and the "new money created by the banking system" is a positive for say 10 years in a row, or something. So aggregate household debt rises 10 years in a row. Each year people are spending more than they earn and that's greasing the wheels of demand expansion and accompanying supply side response. Does that story really necessitate that people are surprised by their realised income 10 years in a row? Ecomedian: "this is why the MMT "all money flows from government spending" concept is a fallacy." Do they say that? If so, yes they are wrong. Luis Enrique: Consider an equilibrium where money growth is a fully-anticipated and constant 50% per year. The quantity of money demanded would also be growing at 50% per year, so the right hand side of my equation would be zero, which is compatible with AD and actual income equalling aggregate expected income, so the left hand side would be zero too. OK, thanks Nick. I don't really understand why money demand subtracts from things, will have to go away and digest. There is no exante exposte accounting identity problem see this talk by Steve at last years Seminar at the fields institute http://www.youtube.com/watch?v=pOxZixjorho Basically ex ante is before the credit creation, then credit is an instantaneous creation of money, then looking backwards ex poste you need to account for that creation of money. The fields institute has modelled this using Lebeseque integration - see this nice diagram on my webpage http://andrewlainton.wordpress.com/2012/12/06/some-notes-on-pontus-rendahls-review-of-keensian-economics/ because of Carethedory's theorum any model using Lebesque integration can be modelled using ODEs which is what Keen uses. On your second point, no Steve is not talking about mercentile 'credit' only net creation of money through financial assets. This is important for example he agrees with me and Werner that treasury bonds Iexcept when purchased by central bank money creation) do not lead to net credit creation - they are simply transfer payments. Nick an interesting post though trying a bid too hard to squeeze into a neoclassical box a profoundly disequailibrium process. The 'minus the increase in money demanded' (surely this dimensionally should be a flow as the units are dollars/time?) I think comes from my comments to him that this 'flow' i.e. change to the rate of savings (increase or decrease in idle balances) should form part of the equations, as it did from at least one historical precursor of this theory. (you know the wepage im talking about you commented on it). I think the big gap in your treatment is whether debt finances an increase in investment - growth - or increase in asset prices. Youve left out Steve's Minksyian influence. If the former then whether or not the increase in income is fully anticipated there will be an increase in net wealth. Also the change in debt can be negative, people paying back debts leads to net decreases in money. However if peoples real incomes have grown because of productive investment then the real cost of debt servicing will fall and people will be better off despite the deflationary effect of deleveraging. I see Steve's theory very much as a theory of growth in the classical 'expanding the market' tradition. Your treatment has the lucasian advice of real things only happening to the economy if their are 'surprises' or 'shocks'. Of course some spending from credit will not lead to an increase in production, it may simply run down inventory, but this is no blow to Keen Credit Cycle theory, after all Hawtry developed a very similar theory where almost identical equations were expressed verbally involving the building up and running down of normal buffer stock inventories. Dear all: I'm off canoeing for a few days, in the wild places where even cellphones don't work. Have fun, play nice, and if your comment doesn't appear it probably means it has gone into spam, and will be fished out later. I believe Steve Keen is aware of your second problem. It looks like he means increase in net credit, and change in debt is only a proxy for this, and it's not clear how good a one. Your first point is trickier. You're doing different accounting based on different assumptions. Try something simple. People borrow a Billion dollars of new bank money this year. They spend the money on goods and services tracked by GDP. GDP increases. "So at the end of the month the average individual is surprised to discover that his income was $100 more than he expected it to be, and that he has $100 more in his chequing account than he expected to have and planned to have"
This is what happens when you believe in representative agents. You can drown in a lake with an average depth of 1 foot. The borrowers aren't necessarily the people who will be getting the money back as earnings, nor are they acting in timeless simultaneity. Where then does the money go? Some of it adds to the inflation component of NGDP, some adds to asset prices not tracked by NGDP, some counteracts certain underlying deflationary trends (cheap imports, decreasing labor share...), and some is spread over an increasing population. This is exactly what we've seen. People borrow to compensate for wage stagnation and to run up the value of assets, and the pain is lessened by low import prices. I can buy a DVD player for $30, an air conditioner for $100 (it will soon cost more to recycle one than to buy one) and a 32" flat screen TV for $250. OTOH I hope I never need a plumber. The question is, what happens when you turn off the tap. In NIPA accounting net credit works invisibly, but it still works. Timeless NIPA accounting can't be applied to equations with explicit time without some sort of modification. You wouldn't ask how many kilowatts are in a megawatt hour, would you? "We know that a sensible central bank would eventually do something else to stop the whole thing rolling before aggregate planned nominal expenditure gets too big for consistency with the inflation or whatever target." I don't quite understand how this bit fits into Keen's model. He thinks that bank lending drives up and becomes increasing part of AD over time during a boom period but this eventually become unsustainable, then loans start not getting renewed causing downward pressure on AD and a recession. Keens shows charts to back this theory up showing debt/gdp ratios increasing in the lead up to 2008 and then declining afterwards. However this all seems to happen during a period where the CB was indeed targeting inflation and NGDP was growing at a steady 5% annually. "I don't really understand why money demand subtracts from things." "Aggregate planned nominal expenditure equals aggregate expected nominal income plus amount of new money created by the banking system minus increase in the stock of money demanded." Aggregate planned nominal expenditures could exceed national income plus the amount of loans the banking system is willing to make. If everyone planned on spending $1 billion dollars today, the banking system may not be willing to extend enough credit to make it happen. Nick: I don’t get your rebuttal of my August 23, 2013 at 04:09 AM point. Okay, gotcha. Nick is referring to liquidity preference (demand for the most liquid of assets). It would kind of strange for someone to borrow money without a planned purchase for that money. Not saying it never happens, just that it would be quite unusual. Frank, in a sense I "borrow" money without a planned purchase for it all the time - when I visit the ATM to refill my wallet. I have a very literal money demand - I want to hold a physical stock of money purely for the liquidity value. More generally, you probably won't see people taking out actual loans just to hold on to the cash, but when you introduce multiple people you can get the same effect. My employer might borrow money to pay my salary, and when I receive my salary I don't have any specific plan for what to do with it so I let it sit in my bank account. "in a sense I "borrow" money without a planned purchase for it all the time - when I visit the ATM to refill my wallet. I have a very literal money demand - I want to hold a physical stock of money purely for the liquidity value." In what sense is that borrowing? NGDP doesn't include transactions that are not value added - no purchase of goods already accounted for, capital gains, borrowing etc. There's nothing to make any level of debt incompatible with steady NGDP growth per se. That requires some other part of your economic model. This comes back to the economic blog perennials that asset inflation isn't inflation, and whether central banks should target asset inflation when CPI inflation or NGDP is on target(depending on your preference of target). In the sense that I am selling a slightly-less-liquid interest-bearing asset (deposits) for a slightly-more-liquid non-interest-bearing asset (currency). Single agent Si wants to buy a DVD player. Si goes to the bank and gets $100 in a deposits (a bank liability). Through the magic of fractional reserve banking, the bank creates a $100 deposit liability for Si and an offsetting $100 asset (the loan) which it holds on its books against Si. With the deposits (skipping over steps involved with exchanging deposits for currency and back), Si buys a DVD player from Si the manufacturer. Si as manufacturer, hires Si as an employee to make the DVD player, paying Si with the money customer Si payed for it. This payment is income to Si employee, which Si employee/customer deposits in the bank. At some future time Si and the bank may decide cancel the banks deposit liability and loan asset. The loop is closed, GDP = GDI = GDE = $100, and Si is his own grandpa. Does this sound about right, sarcasm aside? I still don't see how moving from one asset to another constitutes "borrowing". No new liabilities have been incurred by you. If you placed cash in a bank account, then this is borrowing, but on the part of the bank. Good point. The money supply and total loans could be going up in parallel. If most of this new money goes towards increased spending on asset that don't count for NGDP (rather than final goods, that do) then this could indeed lead to increasing debt/gdp ratios while NGDP growth stays on trend. In fact its quite possible that in a boom you could well see banks becoming more leveraged by lending more against existing assets and this new money then drives up asset prices while NGDP is little affected. If the CB targets NGDP growth this may dampen things down enough in terms of final sales but not necessarily in terms of bank leverage or asset price inflation. So if Nick's view of what Keane says is correct then one can make something of a case that if the CB is only looking at NGDP it might miss other bad things that are happening in the economy until they cause a crisis that affects NGDP negatively and drives the economy into a ZLB scenario. You also have to consider purchases of low cost foreign goods reducing CPI inflation, while the recycled money fuels the fire. Who knows in what order these train wrecks will occur? Peter N -- exactly. CPI has been an unreliable indicator for a long time. This point is not made enough. It's impossible to separate the recent spate of credit bubbles from the fact that, increasingly, preferred monetary gauges are not working correctly. Back from canoeing, in case anyone is still reading. Drive 3 hours from the capital city, paddle a few hours, get your own private beach, on what might as well be your own private lake too, swim in water probably clean enough to drink, and all for $8 per person per night. Canada eh! Andrew: "Nick an interesting post though trying a bid too hard to squeeze into a neoclassical box a profoundly disequailibrium process." But I did keep saying "this is a disequilibrium process"! Expectations falsified, money demand not equal to quantity of money, that's diequilibrium. "The 'minus the increase in money demanded' (surely this dimensionally should be a flow as the units are dollars/time?)" Yes, it's a flow. I said that. Quantity of money demanded is a stock, that has the units $, and the amount by which it is increasing per month is a flow, with units $/month. Ron: ""We know that a sensible central bank would eventually do something else to stop the whole thing rolling before aggregate planned nominal expenditure gets too big for consistency with the inflation or whatever target." I don't quite understand how this bit fits into Keen's model." It doesn't. I think this theory can work for a short run increase in *bank* credit, starting from a recession, but I don't think it does work as a long run theory of *all* debt. PeterN @5.22: that sounds about right. Except: "At some future time Si and the bank may decide cancel the banks deposit liability and loan asset." We are not sure when that future time will be. Because Si has been surprised to find: he's got a job and is earning $1,000 per month more income than he expected; he has $1,000 more in his chequing account than he expected. He will revise his plans in the light of those surprises. He might pay back the loan, or he might decide to spend more. It will depend on whether he thinks this is a temporary or permanent change. Yes the loan probably won't be repaid. In fact let's assume that Si borrows an additional $100 every month. 1) how is the effect of the additional credit distributed between RGDP, CPI inflation and inflation of assets not part of GDP. 2) what happens when instead of borrowing Si has to start repaying the loans. This is the Steve Keen question stripped down to its most basic possible form. The mechanism is certainly of great interest, but first it would be nice to agree on the effects as stylized fact. Of course the bank may securitize the loans and sell them, but I think poor Si has worked hard enough. Single agent models within NIPA can get extremely perverse warping time, space and motivation. As far as debt goes, net credit is net credit. This should be observable. It's effects may be subject to debate, but not its existence. Do we need to add "planned borrowing/paybacks" to the equation? Think about both aggregate planned borrowing and planned aggregate borrowing? If planned borrowing goes up, does this increase demand (planned expenditure)? Ceteris paribus, you'd have to say yes. "Nothing in the above violates any national income accounting identity." Actually that equation can't be right or wrong, because demand is not an accounting measure. You'll never find "demand" in that national accounts, in balance sheets, income statements, or flows of funds. In its general form it's a curve, not an amount. You can't put a curve in an accounting identity. "Demand" is an expression of what people, at a given moment in time, *would* buy over the ensuing period at various price points. It's a formula (often expressed as a curve), not an amount. And there's no simple accounting measure that can tell us what "demand" was at a given moment, with that moment's given price point -- what people at that moment wanted to buy over the ensuing period. Nick accommodates Steve's effort to construct demand as such, but I think that effort (by both) results in part of the disconnect. Here's a way to frame the question: "Looking back: what was aggregate demand on July 31, 2010?" That could be an amount (given prices at that moment). And one could construct a formula trying to suss out the answer, built from national account data now available post hoc, describing that moment. Now, in the simplest S/D construct, if you know the price point at that moment and assume that it will remain unchanged over the ensuing period, you can specify demand as an amount -- an output from the formula, a point on the curve. Talking short term as Nick does here, that's an okay assumption. But what we're really asking: what's the formula? Looking back we can ask, what was demand on August 12, 2011? A single accounting measure can't answer that. For instance, GDP can't be the answer. The amount sold might be affected by short supply. So "demand" was higher than satisfied demand (GDP). So what combination of accounting measures (available now, looking back, post-hoc) can we use to suss out that answer? How much did people at that moment *want* to buy over the ensuing period at that moment's price point? We might get the best feel for that number using measures both preceding and succeeding that moment. You could come up with any number of formulas, using any number of measures. I'm kind of taken with Ed Lambert's work here (effectivedemand.typepad.com), because he seems to (at least intuitively and implicitly) understand this conceptual situation. His formula and chosen measures might be singular or idiosyncratic, but I would expect such a formula to be so. It's trying to construct an economic measure ("demand" at a given point in time) from an infinite menu of available accounting measures -- stock measures describing that moment, and flow measures describing periods surrounding that moment -- and an infinite number of possible formulas combining those measures. "GDP plus new debt" is insufficiently specified unless you say "GDP plus new debt *over some specified periods* relative to the moment at which you're trying to estimate 'demand'. Demand is an economic concept describing people's desires, not an accounting measure. But we might be able to create an effective, useful estimate/measure of demand at a given moment by combining accounting measures using a formula. It would be especially great if the accounting measures used were all antecedent to the "demand moment." Then we could estimate in semi-real-time what "demand" is right now. I find it significant that out-of-the-boxers Steve Keen and Ed Lambert are the only people I know of who are trying to define demand rigorously and formulaically -- and potentially usefully. Or am I wrong on that? Steve: "I find it significant that out-of-the-boxers Steve Keen and Ed Lambert are the only people I know of who are trying to define demand rigorously and formulaically -- and potentially usefully. Or am I wrong on that?" Do you mean deriving (and empirically estimating) an aggregate demand *function*? In mathematical form? If so, yes, you are wrong on that. Most first and second year macro texts mainly do a diagrammatic exposition, but it's a simple matter to put those diagrams into equations and derive an aggregate demand function. Sometimes this is done in the main text, and sometimes it's in an appendix. And various types of econometricians use various different ways to try to put real world numbers into those functions. How useful this mathematisation is is debatable, but they've been doing it since before we were born. A very quick response Nick. Given that we use different languages to express our economics, I think you've provided a pretty good characterization of my argument. I'm very pleased about that, given that there has been so much non-communication involved in this overall issue until now. I'll leave any discussion of differences of opinion to later. I also note the caveats about bringing math in here, but Matheus Grasselli has recently done a comprehensive analysis of the stock-flow mathematics in one of my models to show that the statement that "effective demand of the non-bank public is income plus change in debt" is accounting-consistent with "income = expenditure" when the banking sector and the non-bank sector are lumped together. The issue of whether rising debt adds to demand then comes down to whether loans turn up on the asset or the liability side of the banking system ledger. If we treat banks as mere intermediaries as in the Loanable Funds model, then all lending occurs on the liability side of the ledger, and changes in the level of debt have no impact on aggregate demand--as Krugman has repeatedly argued. If however loans turn up on the asset side of the banking ledger, then the change in debt does add to demand via the money creation mechanism you note. I think the empirical issue here is obvious--bank loans do occur on the asset side of the banking system's ledger--so that rising private debt does add to effective demand (to revive an old term, as Nathan Tankus first recommended). So integrating banking into macroeconomics significantly alters it from a macroeconomics in which banks (and normally also debt and money) are omitted. Having done a more considered re-read, I very happily stand by my first reaction to your post: you've done a very good job of providing a Rosetta Stone between standard Neoclassical macroeconomics, and the perspective on endogenous money macroeconomics that I put forward (along with Richard Werner, Michael Hudson, Dirk Bezemer, Matheus Grasselli and a few others--and I hasten to add that it is still a minority position even within Post Keynesian economics). This is a first Nick, and I have to sincerely thank you for it. It is truly appreciated. "this is why the MMT "all money flows from government spending" concept is a fallacy." No, we don't say anything of the sort and never have. That would be obviously false, as Nick noted. Obviously a misinterpretation somewhere in there, either by you or by whomever you heard it from if that is the case. Much popular MMT tends to display things in a three-sector model -- government, private domestic, and rest of world. Or even a two-sector model: government and private assuming a closed economy. This I think for simplicity of explanation. In those sectoral models, it very much looks like any additional money in the private sector comes from government (or trade surpluses). It emphasizes that the private sector can't acquire net new *financial* assets except when there are injections from those sectors. But that is very far from the full scope of MMT, which in my opinion is best viewed via a four-sector model: private nonfinancial, financial, government, ROW -- or even better five sectors, splitting out private nonfinancial into households and firms. In those models we very much perceive banks, firms, and households as agencies in the economic process. None of these sectoral models is wrong, but they give different impressions of how economies work. Steve, you don't need four or five sectors in MMT to demonstrate private sector creation of 'horizontal money'. Nick: I've been hard-pressed to find a function whose inputs are national accounting measures. They all seem to built on unobservables (or at least unobserveds) like MPC or autonomous consumption. I've been really hard pressed to see a graph of aggregate demand over time that has as observational basis in measures from the national accounts. Maybe my googling's just been insufficient, but if such things are out there they sure are talked about rarely. I just feel like if we're going to use the term, we should have some formulaic definition in mind, based on observed measures, so we can look at the actual derived measure and see how it behaves over time relative to our surmises and other measures. ProfSteveKeen said: "the statement that "effective demand of the non-bank public is income plus change in debt" is accounting-consistent with "income = expenditure" when the banking sector and the non-bank sector are lumped together." 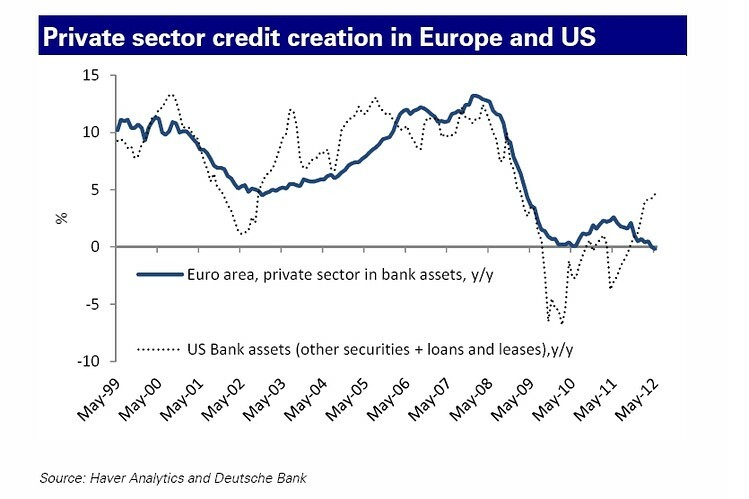 ProfSteveKeen said: "I think the empirical issue here is obvious--bank loans do occur on the asset side of the banking system's ledger--so that rising private debt does add to effective demand (to revive an old term, as Nathan Tankus first recommended). So integrating banking into macroeconomics significantly alters it from a macroeconomics in which banks (and normally also debt and money) are omitted." I believe you are actually getting at the idea that the capital requirement becomes a capital multiplier. Thoughts? Nick's post said: "Luis Enrique: (quoting Steve Keen) """In a credit-based economy, aggregate demand is therefore the sum of income plus the change in debt""
What that misses is that some debt has nothing to do with the creation of money, and doesn't have any obvious effect on either the supply or demand for money, or on AD. Like if I borrow $100 from TMF." I save $100. I lend $100 to Nick Rowe (Nick Rowe borrows $100 from me). I believe Steve Keen would call me saving $100 negative debt. Nick Rowe borrowing $100 from me would be called positive debt. Minus $100 plus positive $100 equals zero. The implied assumption is that in borrowing $100, you have some purchase in mind before borrowing. With that assumption - you are going to immediately spend that $100 - aggregate demand is lifted. The unknown is whether your lender (TMF, Nick, or whoever) had any purchase in mind before instead lending that money to you. "Minus $100 plus positive $100 equals zero." If I pay $100 for apples to Joe, Joe pays $100 for oranges to Nick, and Nick pays $100 for bananas to me, the net money transferred is $0 but the flow of money is positive. Measures of economic activity (like GDP) measure flows not net transfers. Re your statement quoted below Too Much Fed, that is a classic example of "Loanable Funds"--"Patient agent lends to impatient agent". In this case there is no new money creation and the borrower's additional spending power is cancelled out by the lender's lower spending power. But a bank lending is the creation of an asset on one side of its ledger and a liability on the other--not a transfer of money and hence spending power but a creation of money and hence spending power. This is the essential difference between Loanable Funds and Endogenous Money. Loanable Fund shows loans as a minus for one agent (fall in money held by lender) and a plus for another (rise in money held by borrower), which cancel out: in mathematical language, this is a conservative system. Endogenous Money shows loans as a plus for one agent (increase in loan assets held by bank) and a plus for another (increase in money held by borrower). The same accounting balance applies, but in math-speak this is a dissipative system with a creation of money and hence spending power. The assumption here is that new debt that is taken on is immediately spent meaning the liquidity preference for borrowed funds is 0. Income is capital income (interest payments for loans not retained by banks) plus income from the production and sale of goods. Money (M) expands whenever banks retain the loans that they make. And so M can really be said to be equal to the total of loans retained by the banking sector. When a bank securitizes and sells a loan, it pulls money out of circulation. "This is the essential difference between Loanable Funds and Endogenous Money. Loanable Fund shows loans as a minus for one agent (fall in money held by lender) and a plus for another (rise in money held by borrower), which cancel out..."
But whether that cancelling out of money applies to measures of economic activity would depend on the liquidity preference of the lending agent. If agent 1 has $100 but is not inclined to spend it any time soon, while agent 2 will spend the money as soon as it is lent to him then aggregate demand is increased by transferring that money (through a lending process) from an agent with a high liquidity preference (low marginal propensity to consume) to an agent with a low liquidity preference (high marginal propensity to consume). Probably a bit off topic, but what liquidity preference and disposition of debt does Bernanke assume for banks / bankers during the early twentieth century? I would presume that things were a lot different back then - banks / bankers tended to be large net creditors with a high liquidity preference. These days most loans originated by banks are sold off in the form of certificates of deposit / securitized loans and the financial sector as a whole tends to be a large borrower (at least until recently). Also, the redistribution effect has negative consequences when loans are secured by real property. Farm land that is borrowed against becomes property of bank when the loan fails. Bank does not have resources to maintain said farm land. There is an efficient disposition of real goods that gets distorted when loans secured by those real resources fail. Steve (Keen): Thanks! I'm really glad we're sorta on the same page with this. I figured we might be, but I wasn't sure. A lot of this, yes, is a question of translation. On that subject, I don't find the "exogenous vs endogenous money" distinction helpful in this context, simply because different people seem to mean many different things by that. My preferred distinction is between those who believe The Law of Reflux ("the stock of money is determined by the quantity of money people want to hold at the rate of interest set by the banking system, because any excess would immediately return to the banks, so there cannot be an excess supply of money"), and those who don't. Tobin in "Commercial banks as creators of money" was supporting The Law of Reflux, which became the New Orthodoxy against the Old Orthodoxy of the textbooks. Most New Keynesians, and many (not all) Post Keynesians (I think) agree with the Law of Reflux. Those of us who reject it are a weird bunch, who don't necessarily agree on anything else. At the root of the disagreement is a disagreement over whether money is just like other assets or is fundamentally different from other assets. If money were just like other assets, you get the Law of Reflux, and banks as suppliers of money being no different from the suppliers of any other asset, with the quantity of money being determined by supply and demand just like any other asset. I had a quick read of Matheus's accounting framework, but didn't find it helpful for me. Too many sectors. I'm thinking of a way to express it more simply. I've been fixating on the same thinking as Fisher that SK quotes above. But concentrating on the spending behavior of the actors (on newly produced real goods and services), rather than the quantity of currency. o When a people repay debts to financial institutions, the repayers are likely to spend less, but repayees are unlikely to spend more. Banks as lenders don't behave the way people as lenders behave. Their incentives and reaction functions are completely different. You can construct a model wherein portfolio/interest-rate effects mean bank lenders can be treated *as if* they're people lenders (or transparent intermediaries between people lenders). This pretty much is the mainstream model. But that model seems to bear a challenging burden of proof against the first-order fact: when you pay down your credit-card debt, your credit card company doesn't spend more. Nick: you often say people have two ways to get rid of money: buy more stuff or sell less stuff. But you haven't really answered me on the third way: paying down their debt to the financial sector. i.e. using their debit cards instead of their credit cards. Reflux. "This is the essential difference between Loanable Funds and Endogenous Money. Loanable Fund shows loans as a minus for one agent (fall in money held by lender) and a plus for another (rise in money held by borrower), which cancel out: in mathematical language, this is a conservative system. Endogenous Money shows loans as a plus for one agent (increase in loan assets held by bank) and a plus for another (increase in money held by borrower). The same accounting balance applies, but in math-speak this is a dissipative system with a creation of money and hence spending power." I would also say it is even simpler than that. Loanable funds is a 100% capital requirement. Endogenous money is a less than 100% capital requirement. This is getting very interesting now! Nick, comment in spam? Thanks! Nick's post said: "I had a quick read of Matheus's accounting framework, but didn't find it helpful for me. Too many sectors. I'm thinking of a way to express it more simply." Let’s say I save $100,000 in demand deposits at an old bank. Someone else wants to start a new bank. They sell me $100,000 in bank stock (bank capital). The reserve requirement is 0%, and the total capital requirement is 10%. I believe that means the capital requirement is 5% for mortgages and is 10% for ordinary loans. This example will be all mortgages. Because they are 1 to 1 convertible to currency, I consider demand deposits both medium of account (MOA) and medium of exchange (MOE). I am told that by accountants that the new bank equity destroys the demand deposit. M in MV = PY falls by $100,000. The home builder sets up a checking account at the new bank. So 20 checking accounts at the new bank were marked up and then marked down by $100,000 each, while the home builder’s checking account was marked up by the $2,000,000. Let's assume the home builder keeps spending with demand deposits with people who have a checking account at the same bank. No currency and no central bank reserves are involved in this example. 1) M in MV = PY rises by $2,000,000. 2) Overall, I saved $100,000 in MOA/MOE, and the borrowers “dissaved” $2,000,000 in MOA/MOE for a difference of $1,900,000 in MOA/MOE. That difference is why banks and bank-like entities matter. Now raise the capital requirement to 100%. I save $100,000, and now the bank can only make $100,000 in loans for "dissaving". No new MOA or MOE is created. I'm going to say a 100% capital requirement is loanable funds. Anybody know what Krugman would say about my example? SK misrepresents Bernanke. It is clear that Bernanke is dismissing the academic circles of the time, not Fisher. So what does Bernanke say about banks and repayment(s) of loans to them? "No currency and no central bank reserves are involved in this example." That is not quite right. It depends. The new bank might buy treasuries with $100,000 in central bank reserves. "Assets new bank = $100,000 in treasuries plus $2,000,000 in loans"
That would be $100,000 in central bank reserves if the new bank did not buy treasuries. "If the extent of debt-deflation is sufficiently severe, it can also threaten the health of banks and other financial intermediaries..."
"when you pay down your credit-card debt, your credit card company doesn't spend more"
When you repay your debt + interest, doesn't credit card company/bank equity increase? "M in MV = PY falls by $100,000." Not necessarily. The $100,00 in reserves held by the new bank are also part of M. They might not have existed before the old bank paid the new bank $100,000. "Anybody know what Krugman would say about my example?" Too Much Fed: "Let's assume the home builder keeps spending with demand deposits with people who have a checking account at the same bank. No currency and no central bank reserves are involved in this example." Krugman: "yes, commercial banks, unlike other financial intermediaries, can make a loan simply by crediting the borrower with new deposits, but there’s no guarantee that the funds stay there — [this] refutes, in one fell swoop, a lot of the nonsense one hears about how said mechanics of bank lending change everything about the role banks play in the economy." That's probably what he would say. @Phillipe: "When you repay your debt + interest, doesn't credit card company/bank equity increase?" Interest, absolutely yes. Or at least to the extent that it's not offset by expenses, hence is profit, which adds to shareholder equity. "The $100,00 in reserves held by the new bank are also part of M."
I consider M to be currency plus demand deposits because that is what circulates in the real economy along with 1 to 1 convertibility. The banking system needs to be viewed two different ways. 1) Loan creation (maybe even destruction) with a reserve requirement that is not 100% and with a capital requirement that is not 100%. Let's use my example from above. Start in equilibrium. Each individual bank has the amount of bank reserves (vault cash plus central bank reserves) it needs/wants. The whole banking system is in balance. The central bank overnight rate is on target. My demand deposit and central bank reserves "move" to the new bank. The whole banking system is still in balance. The new bank has excess central bank reserves, and the old bank has a deficit of the same amount. The loans get made. The old bank is able to get the home builder to move $100,000 in demand deposits to the old bank. The demand deposit and central bank reserves "move" to the old bank. The old bank and new bank are now in balance. The banking system as a whole is in balance. Now assume the home builder moved all $2,000,000 to the old bank instead of $100,000. The old bank would have $1,900,000 in excess central bank reserves, and the new bank would have a deficit of $1,900,000 in central bank reserves. The banking system overall is still in balance. The new bank should be able to "borrow" central bank reserves in the overnight market or attract demand deposits. Next, change my assumption of 0% reserve requirement to 10%. Now the banking system as a whole could be short of bank reserves (vault cash and central bank reserves) and the new bank could be short of bank reserves even though the home builder keeps the demand deposits in its checking account or only spends with an entity at the same new bank. For Krugman, I'm saying whether the "funds" stay at the new bank or move to another bank does not really matter. It is the capital multiplier that matters. The reserve requirement could matter, but it does not the way the system is working now. The interest payment only, not principal, will increase the credit card company equity. It is unlikely the credit card company will increase spending on goods/services. However, it might try to make more credit card loans. Steve Roth, I'm going to "borrow" your website address for identity. Maybe I won't get put in spam as much. Nick, I'm delighted that you've provided a way for us to communicate on this issue, and I agree that Endogenous Money has been given a lot of different meanings, so the two words themselves don't convey a lot. On the reflux issue, I start from a definition of money as the sum of the liabilities of the banking sector to the non-bank public. An expansion of those liabilities (via the issuance of new loans) expands money, while a contraction (via loan repayment) reduces it, both with obvious effects on the level of economic activity. I think that's more the issue than whether or not there can or cannot be an excess supply. On this front, I've recently used the Minsky software (downloadable from https://sourceforge.net/projects/minsky/) that I've developed thanks to an INET grant to juxtapose the Endogenous Money/Reflux-Loanable Funds perspectives with a simple model which, with four keystrokes, can be converted from a model of one concept to a model of the other. If you're interested, I'd like to set out this model and discuss it with you (whether on or offline) and see whether it clarifies the issues being debated. Too Much Fed, I know that Bernanke went on to develop an interpretation of debt-deflation from his perspective, but this was focusing upon asymmetric information and the financial accelerator rather than the disequilibrium and quantity issues that were at the heart of Fisher's analysis. "I consider M to be currency plus demand deposits because that is what circulates in the real economy"
Ok, but say for example you started a new bank and the Fed decided to just give you a $1 reserve balance as a gift for some reason. You now have a $1M reserve balance at the Fed. Do you have more money that you had before? Of course! You have $1M in reserves, and reserves are money. *should have been: "the Fed decided to just give you a $1M reserve balance"
I know BB tried to formalize Fisher's debt-deflation ideas, but I don't like the way he went about it. So I'll keep using a quote in which BB observed that academics dismissed Fisher to say BB himself dismissed of Fisher. Apologies if this is uncivil, but... that's just awful. Formalizing debt-deflation would require looking at debt as a legal claim on more than money. Ben is partially right, deflation would simply be a transfer of monetary wealth from debtor to lender with no aggregate effect (assuming the propensity to spend is equal among both creditor and lender). But when lending is secured against real property, then that real property can be transferred without regard to whether the new owner can or will use those it productively. Cab driver borrows from farmer using taxi cab as collateral. Farmer borrows from cab driver using farm tractor as collateral. Both default on loan - cab driver gets a farm tractor and farmer gets a taxi cab. If I sell my computer to my bank, the money supply expands. If I then buy that computer back from my bank, the money supply contracts. Similarly: If I sell my IOU to the bank (if i take out a loan), the money supply expands. If I then buy that IOU back from the bank (if I repay the loan), the money supply contracts. In the real world, banks buy and sell a lot of other people's IOUs, but don't buy and sell many other things, like computers. But the principle is exactly the same. We can even imagine banks that only buy and sell land (and rent out that land to farmers) in exchange for the money they create when they buy land and destroy when they sell land. and in that imaginary world, if banks set a price on which they would buy or sell land, would the stock of money be determined by the demand for money or by the demand to hold land? Would it be possible to have a state of affairs in which people were holding more money than they wished to hold but exactly the amount of land they wished to hold? I say it is possible. Back in the real world, we can translate that question as: Would it be possible to have a state of affairs in which people were holding more money than they wished to hold but have exactly the amount of bankloans they wished to have? I say it is possible. Does the demand for money eventually adjust to the supply of money created by the demand for loans/land? Or does the demand for loans/land immediately adjust to the demand for money? What's special about banks is not what they buy with the money they create, but that they create money. And thinking about banks as buying and selling computers or land can help us make that distinction more clearly. "Ben is partially right, deflation would simply be a transfer of monetary wealth from debtor to lender with no aggregate effect (assuming the propensity to spend is equal among both creditor and lender)." I don't see your point, here. Bernanke says this was the argument that academics used to use in order to dismiss Fisher. Either they did use that argument and Bernanke is correct, or they did not use that argument and Bernanke is wrong. Unless I missed it, Bernanke does not say that the old view itself is logical or illogical-- let alone correct or incorrect. However, Bernanke quite expressly goes on at length explaining that the old argument is outdated and modern thought on debt-deflation is different. I don't see anything which suggests that he is partially incorrect. He certainly dismisses neither Fisher nor debt-deflation. If anything, it could be read as a defense of debt-deflation against the old view, no? Philippe's post said: ""I consider M to be currency plus demand deposits because that is what circulates in the real economy"
Ok, but say for example you started a new bank and the Fed decided to just give you a $1 reserve balance as a gift for some reason. You now have a $1M reserve balance at the Fed. Do you have more money that you had before? Of course! You have $1M in reserves, and reserves are money." That is a yes/no answer. The $1M in central bank reserves is "money" (a term I don't like to use) in the banking system. I start a new bank and the fed gifts the $1M in central bank reserves (the fed does not own the new equity). Now buy $1M in computers. The $1M in equity allowed the new bank to pay the computer company, who has an account at the same bank, with demand deposits. I am pretty sure computers are an expense which lowers equity. The point is the bank can't pay the computer company directly with the central bank reserves. Nick's post said: "If I sell my computer to my bank, the money supply expands. If I then buy that computer back from my bank, the money supply contracts." And, "What's special about banks is not what they buy with the money they create, but that they create money. And thinking about banks as buying and selling computers or land can help us make that distinction more clearly." I believe computers are an expense. Let's say the land purchase has a 100% capital requirement. In both cases and overall, no NEW "money" (demand deposits) is created because there is no leverage involved. The amount of new "money" created is the same or less than the amount destroyed (see equity). When you talk about money here, are you thinking of that part of bank liabilities that can be used for payments, say the aggregate positive balance of checking accounts? Or are you thinking about all non-capital liabilities of banks, including repo, term deposits, fixed income note issues, etc.? If it's the former, that would seem to be determined primarily by the demand to hold medium of exchange. People can easily get rid of an excess of checking account money by paying into their savings accounts. It doesn't require loans to be repaid. If it's the latter, what is so special about banks that makes their term liabilities money and not comparable liabilities issued by non-banks? Nick (Edmonds): it's the former. Stuff that gets used as a medium of exchange. True. You could either pay down your loan at the bank, or else put it in a term deposit at the bank. But why get rid of excess money at the bank, when there are 1,001 other places you (as an individual, but not us in aggregate) could get rid of it too? Any shop will take the stuff. Because it's money. "The point is the bank can't pay the computer company directly with the central bank reserves." Yeah it can, if it really wants to. Take out the reserves as cash in a van, drive down the road to the computer shop, dump $1M in cash on the counter and say "I want to buy some computers, what can I get for $1M?" Only kidding, but the point is reserves are just cash held at the central bank. In electronic form. Say your computer supplier has an account at another bank (more likely). Make a payment to his account at that bank. Your reserve account loses it's $1M balance and his bank gets it. You're back to $0 but now you have some computers. "If I sell my computer to my bank, the money supply expands. If I then buy that computer back from my bank, the money supply contracts. Similarly: If I sell my IOU to the bank (if i take out a loan), the money supply expands. If I then buy that IOU back from the bank (if I repay the loan), the money supply contracts." N0, in the first case the bank is making a purchase of a commodity from you that it has to source from the liabilities and equity side of its ledger--not the asset side. To do otherwise is to commit seignorage--to use its capability to produce the IOUs we all use for transactions for its own use. So when a bank buys goods from non-banks, it uses the funds it has legitimately earned from its business of lending, not by using its capacity to create money. So there is no change in the money supply in either case. I do of course agree that the very special role of banks is that they create money. Including that properly in macroeconomics alters the field dramatically in my view. Your second case is one of course where they do create money (and repaying the loan destroys it). This is one reason that I have come to appreciate the importance of using double-entry bookkeeping to explain the actions of banks: your first example involves transactions only on the liabilities & equity side of their ledger which transfers existing money but does not create or destroy it; the second involves an increase in assets and liabilities when the loan is made that increases money (and demand) while the repayment reduces assets and liabilities (and demand). Addendum: my definition of money as the liabilities of the banking sector to the non-bank public omitted cash in the possession of the public--of course that is also part of the money supply. "Accepted as full payment for goods"
"Which doesn’t confer seignorage rights on the issuer"
Sort of ignores state-issued currency doesn't it? Nick is correct on the computer accounting. The bank’s purchase of a computer expands the money supply. If the computer is capitalized on the balance sheet as an investment, the computer appears as an asset, equity is unchanged, and the money supply increases by the amount of the deposit created by the bank’s purchase of the computer. The balance sheet change is an increase in an asset matched by an increase in money supply. If the computer is expensed on the income statement, the computer does not appear as an asset on the balance sheet, equity is reduced by the cost of the computer, and money supply increases by the amount of the deposit created by the bank’s purchase of the computer. The balance sheet change is a reduction in equity matched by an increase in money supply. And of course Nick is correct on the IOU accounting as well. Steve Keen: "N0, in the first case the bank is making a purchase of a commodity from you that it has to source from the liabilities and equity side of its ledger--not the asset side. To do otherwise is to commit seignorage"
That is quite wrong and it doesn't violate Graziani's ideas. If a bank purchases a computer it simply credits the computer seller's account (assuming the seller banks with the same bank). The bank is not doing an seigniorage (as defined in this context) by this method because the seller can move funds outside the bank. You use the phrase "legitimately earned" but there is nothing illegitimate about what you deny. And JKH's September 05, 2013 at 09:53 PM is so rightly and optimally worded that is true even if the computer seller banks with another bank. Philippe said: "Say your computer supplier has an account at another bank (more likely). Make a payment to his account at that bank. Your reserve account loses it's $1M balance and his bank gets it. You're back to $0 but now you have some computers." I said: "Now buy $1M in computers. The $1M in equity allowed the new bank to pay the computer company, who has an account at the same bank, with demand deposits. I am pretty sure computers are an expense which lowers equity. Equity new bank = $0"
Now have the computer company move all their demand deposits to another bank. Notice the accounting ends up the same. The new bank has the computers. Thanks for the clarifying. That's very helpful. I'd agree that the new money created from a new loan is likely to be spent. For a start, the borrower is likely to spend it all. Why borrow money just to put it on deposit? If the borrower spends it on produced goods, then someone else's income has gone up, so they'll probably spend more as well. I suspect where we differ is whether the increase in spending is permanent or temporary. I think it's temporary. The borrower can't keep up his spending. He financed it with the loan. He's blown that now and has just got debt service payments. And if his spending has fallen, other people's income will have fallen as well. We end up closer to where we were before. But what about the new money created? Isn't that going to keep going round until we satisfy the money demand equation Md = kPY ? "Does the demand for money eventually adjust to the supply of money created by the demand for loans/land? Or does the demand for loans/land immediately adjust to the demand for money?" is a false dichotomy. The supply of money (on your definition) can adjust very easily quite independently of the demand for loans. So when there are no more new loans and NGDP declines, the amount of money also declines, even though the amount of loans is constant. Re JKH and Ramanan, I don't want to get bogged down in discussions of where an accountant might allocate that purchase: what we agree upon is that if it is allocated to the asset side, then it increases the money supply and demand, as Nick first said, and if to the liabilities/equity side, then it doesn't. It's more valuable to focus on is the point Nick concludes with that "What's special about banks is not what they buy with the money they create, but that they create money", and his original conclusion that my "effective demand is income plus the change in debt", at least when translated into his "Aggregate planned nominal expenditure equals aggregate expected nominal income plus amount of new money created by the banking system minus increase in the stock of money demanded", doesn't violate " any national income accounting identity", and therefore potentially indicates a disequilibrium source of additional demand to that identified in the conventional formula (and the reflux view). This is ultimately an empirical question: if it's insignificant then so will be the correlations between change in debt and economic activity; if it's significant then they'll be strong and provide explanations for what remain puzzles in the conventional view. This is in part Nick Edmonds hypothesis: "I suspect where we differ is whether the increase in spending is permanent or temporary. I think it's temporary". If the effect I've identified is temporary--and if that matters--then the change in debt will not be a significant factor in macroeconomics. I suggest that it's temporary and that that doesn't matter, because--to twist Keynes a bit--in the long run we are always in the short run, so that disequilibrium is a permanent state of the economy even if each instance is temporary. But I could be wrong on that: ultimately, it's the data that matters, not suppositions. So now that we're agreed that there is an effect, let's turn to the empirical data to see whether it's significant. I suggest looking at the correlation between the change in bank debt of the non-bank public and the unemployment rate from (say) 1990 till today. My hypothesis extends to asset markets too, and to the rate of change of demand as well as its level--in which case I hypothesize a relationship between the acceleration of mortgage debt (for example) and the rate of change of house prices (using annual data in both instances since the monthly data in both cases is so volatile). When I have time I'll post a link to data and graphs on this--though of course anyone here can have a crack at it themselves. I'm off to a 7am-9am course now here in Ecuador. "I suggest looking at the correlation between the change in bank debt of the non-bank public and the unemployment rate from (say) 1990 till today." I think it is trivially obvious and natural to hypothesize some sort of logical relationship between growth in debt and growth in GDP. But what some of us are going on about is that this should be set up unambiguously as a regression relationship and a model to suit - not to mangle it up with some incongruous and inconsistent reformulation of a national income accounting identity. That is all we are saying. And please note that by logic the relevant accounting identities hold at all times and that this cannot be changed by invoking continuous time. I suspect most of us here think that debt matters; we just differ on how and why. I don't think the impact on money is the reason debt matters, however you want to define money. This means that I think non-bank debt also matters. Maybe not as much as bank debt, but it's still important. I think there is a real danger in underestimating the impact of shadow banking and disintermediated debt. However, from what I understand you are saying, I think we agree on the temporary / permanent issue. The impact of new debt is temporary. But when debt has been growing for decades, both in absolute terms and relative to income, that's a pretty sustained temporary effect. The problem is that the debt to income ratio cannot grow forever and when it stops growing, you've got a problem. BTW, it was you that made a specific point to Nick on the accounting - which was completely wrong - and I corrected it - and you're welcome. So let's please get that straight on who's getting hung up on what. Also, the fact that Krugman is poor on endogenous money understanding doesn't mean he was wrong on his original point 18 months ago regarding your new AD equation. The issue isn't that there isn't a relationship here - it's clarity in expressing it. "N0, in the first case the bank is making a purchase of a commodity from you that it has to source from the liabilities and equity side of its ledger--not the asset side. To do otherwise is to commit seignorage--to use its capability to produce the IOUs we all use for transactions for its own use. So when a bank buys goods from non-banks, it uses the funds it has legitimately earned from its business of lending, not by using its capacity to create money. So there is no change in the money supply in either case." The presumption here is that banks are never debtors when in fact most are. Commercial banks realize their earnings from the spread between their short term borrowing costs and the long term interest rates they lend at. If the central bank was buying the computers, then you could make the case that it can commit seignorage - it could literally create money without a corresponding IOU, but your run of the mill commercial bank cannot. Ramanan: I was wondering when you would show up! A secondary reason for writing this post is to draw a link between what Steve was saying and: what Old Keynesians were saying when they zig-zag along between the AE curve and the 45 degree line in successive rounds of the multiplier process; what Old Monetarists were saying when they talk about the hot potato process; maybe also, what pre General Theory British monetary economists were saying when they wrote down something like I=S+change in money supply (but I read that stuff too long ago and my memory is too bad to say anything more). I put a couple of links at the end of the post to my old posts on that. JKH: I was asking myself last night: where is JKH when you need him? Because we talked about the computer case a few years back, IIRC. Steve: I think (maybe) the biggest difference between us (in this context!) is that you focus more on the asset side and I focus more on the liabilities side of banks' balance sheets. Let me state my view, to see if this clarifies things. What's on the asset side matters for a bank's solvency and liquidity if people want to redeem their money. This matters a lot for commercial banks, which promise to redeem their money at a fixed exchange rate for central bank money. It matters also for central banks that promise to redeem their monetary liabilities at a fixed exchange rate for gold or USD or some other good. (Except that central banks typically earn considerable monopoly profits and the present value of those monopoly profits is a much bigger asset than what appears on the balance sheet.) If there's a risk of insolvency or a bank run, the size and composition of the asset side matters. But provided the assets are good enough so we can ignore those risks, it is only the liabilities side that matters in the money-creation process. are all the same, in terms of creating money, and their effects on the liabilities side, though they will have very different effects on the asset side. And the metaphorical "helicopter money" is exactly like a bank giving money to charity. In other words, the only difference between helicopter money and the bank making a loan is that the former isn't so good for the bank's solvency and liquidity. A loan that goes bad is ex post helicopter money. The big argument is that between people like you and me on one side, and the Tobin of "Commercial banks as creators of money" on the other side, as exemplified by Nick Edmonds here. I'm the first to concede that I'm not a statistician/econometrician (or accountant!) --nonlinear dynamic analysis is my forte--so I'd be pleased to have others with more expertise analyze this data.